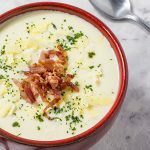 Keto Cheese & Bacon Cauliflower Soup "Easy & Creamy" Winter Warmer! Our Keto Cheese & Bacon Cauliflower Soup is smooth, creamy and delicious. It makes a great lunch or dinner. Very Easy to make in bulk as your go-to Low-Carb "Winter Warmer"
Place a large saucepan over high heat. Add the butter and garlic and saute for 3 minutes. Add the cauliflower and stir to coat in the butter. Saute for 2 minutes. Add the heavy cream, chicken stock and pepper, and reduce the heat until the pot is simmering. Simmer for 15-20 minutes, until the cauliflower is tender. In a large non-stick frying pan add the bacon and place over high heat. Saute for 10-15 minutes, until the bacon is starting to crisp. Set the bacon aside, while you blend the soup. Using your stick blender, blend the soup into a smooth puree. Add the bacon and parmesan cheese into the cauliflower soup and mix well with a spoon. Taste the soup and add salt if desired.